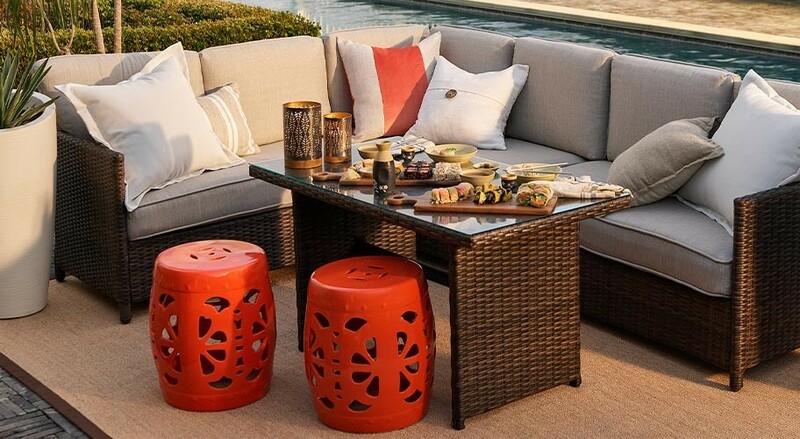 Shop patio furniture, decor and more to create the perfect escape right in your own backyard. Then, sit back and enjoy your new happy place. Depending on the climate you live in, you have several months out of the year in which to fully enjoy your backyard. You may have a patio and a strip of green if you live in an urban setting, or you may have a large yard with plenty of green space that allows you, your family and your friends to spread out. Patio furniture is a good place to start when outfitting your outdoor space. Those who have a large patio can choose sofas, chairs and outdoor dining sets. No exterior space is complete without a grill, and an outdoor kitchen is especially family- and entertaining-friendly. At Walmart, we offer many different pieces of outdoor furniture from which you can choose. 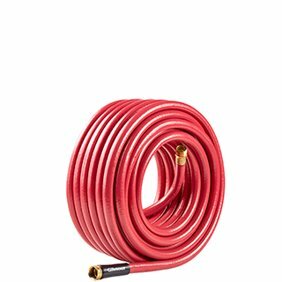 Check out our Best Sellers, Special Buys and Clearance items for great finds on pieces to make your patio and backyard a place to which you'll rush home. Patio furniture takes many forms. Some of the most common pieces are chaise lounges and chairs. Materials that this furniture is made of include aluminum, metal, wood and PVC. Some chairs and chaise lounges have mesh seats and backs. For added comfort, look for chairs that have accessories like overhangs and cup holders and have their own padding attached. If your desired piece doesn't come with them, we have several pads you can attach to them. Chairs that are portable and break down so they fit into a carry bag easily make it easy for you to use them at home, at the beach or an outdoor concert. If you entertain often outside, we have two- and three-person benches for added seating, and some of these have storage underneath. To relax in style, consider chairs that are also rocking chairs or are Adirondack-style chairs that are a cross between a chair and chaise lounge. 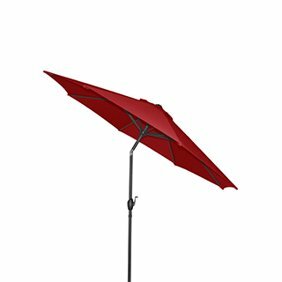 Outdoor dining sets that have tables that allow for a large umbrella to insert through provide shade when it's time to sit down to lunch or dinner. 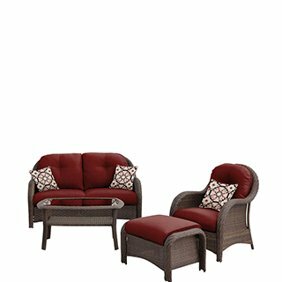 Other types of outdoor furniture sets we have include conversation sets, bistro sets, sectionals and sofas. Many of the permanent pieces also have covers to protect them from inclement weather. A backyard doesn t seem complete without a grill or two in use. Having a grill as part of your patio setup means less time inside the house on nice days and a chance to show off your culinary skills even if it's just for grilling hot dogs and hamburgers. Grills come in many assorted styles, and we have several for you to consider. Gas grills and charcoal grills are the most common, with electric grills also being an option. 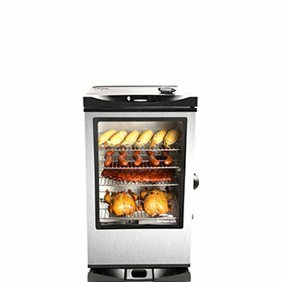 There are also portable grills that you can use on a table or when you're out at the beach or park, and smokers or pellet grills make it so you can slow-roast meats and vegetables and add a lot of smoky flavor to them. Gas grills come in two forms: propane and natural gas. 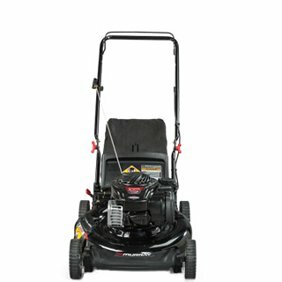 Propane gas grills require a canister of propane to be attached, but this allows these grills to be used anywhere in the backyard or even away from home. Natural gas grills require a hookup to the home and can only go as far as the gas line allows them. Charcoal grills use lighted charcoal briquettes to supply the heat. Gas grills allow you to control the flame better, but some people prefer the taste that comes from cooking over charcoal. Having some furniture and a grill on the patio is a terrific start. However, you may want to consider adding some homier touches to complete the scene. A couple of planters or large pots with flowers is a nice touch, or if you're doing a lot of cooking outside, you may want to grow some fresh herbs. Outdoor lighting is also essential because you don't want to be forced to go inside once the sun sets. Options you have here include landscape and deck lights, decorative lights that you connect to your home, tiki torches, colored bulbs on strands that you hang strategically around the patio or even flood lights. 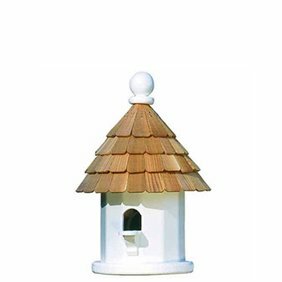 Other decorations you can add to brighten your patio area and backyard include bird baths, bird feeders, fountains, garden statues, weathervanes and even a small pond. The choices come to life with your imagination, so see what we have to offer and what inspires you.